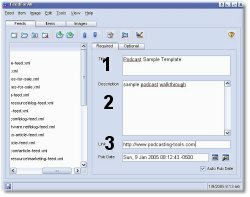 PowerPoint presentations can be included in RSS feeds as an enclosure. The process is suprisingly simple, and by making PowerPoints available using RSS, publishers give viewers of what they watch and when. 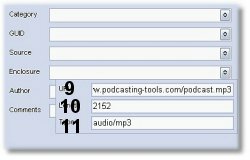 Also, many podcasts are available for syndication, which increase the exposure presentations will recieve. 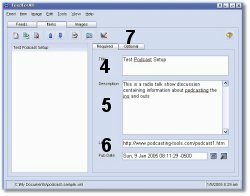 The following is a step by step tutorial that explains how to setup your PowerPoint in the RSS feed. 1. Enter a title for the new feed. 2. Enter a collective description of all the PowerPoint files contained in the RSS feed. 3. Enter the URL of the website or webpage you want associated with the RSS feed. 4. Enter a title for this specific PowerPoint file. 5. Enter a description of what the PowerPoint file contains. 6. Enter the URL of the website or webpage you want associated with the PowerPoint file. 9. Enter the URL of the PowerPoint presentation on the web. 10. 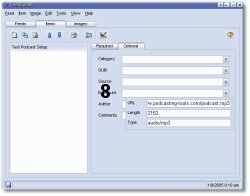 List the file size of the presentation in bytes (without commas). 11. List PowerPoint and the format. While you can distribute PowerPoint's using the above model, many publishers instead opt to convert their PowerPoint to a video file and create a videocast. The benefit to converting the PowerPoints to video are that they can then be viewed on portable devices like iPods, not just computers that have PowerPoint or PowerPoint viewers installed. If you instead prefer to include the PowerPoint as a video file please refer to the videocasting tutorial.